How hot is healthy working out? Thank goodness it happened when the weather was cool. At the end of April, the central air conditioning unit for my training center stopped working. The technicians who looked at it had to order parts, so it was going to be down for a couple days. No problem I thought, we just turned on a couple fans and opened the windows to keep the temperature down. Little did I know how much difference a couple degrees can make. 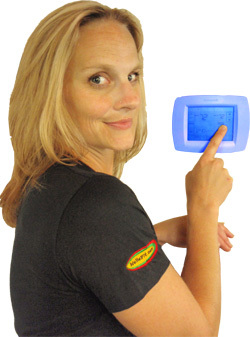 Temperature control in a gym is extremely important. Too cold and your muscles won't stay warm through the entire workout. When it gets really cold your body may start to shiver in an attempt to warm up. Too hot and you'll start to feel uncomfortable, sweat profusely and eventually overheat. The American College of Sports Medicine has a 211 page book that carefully covers the smallest details of how health and fitness facilities should be maintained. When it comes to temperature, the recommendation is simple. "Appropriate temperature, humidity and air circulation levels should be maintained in the fitness floor area. The following levels are recommended: Temperature: 68 to 72 degrees Fahrenheit." When the air conditioning broke down, the average temperature rose to 78 degrees. It didn't seem like much, but what happened to people working in that environment was amazing. At 75 degrees, people who were clothed start becoming more lethargic and sleepy. People in gym shorts and a workout shirt didn't much notice, but anyone wearing long pants and a long-sleeve shirt started to feel warm. At 78 degrees, people had to stop much more frequently, cold water consumption rose dramatically and we started using chilled towels during the workouts instead of just at the end. When we looked at the research, if temperature rose just two more degrees to 80, we could expect the effectiveness of the workouts to drop by as much as 40-50%! Now here's the really odd part. Some of the people who weighed themselves after a session in the heat saw their weight drop by as much as 1 to 1.5 pounds. Yet they hadn't been able to lift as much or run as far. What was going on? Was the heat helping their bodies burn more fat? No, the heat just made them sweat more. The weight loss was all dehydration that they put right back on the moment they drank some water. They didn't drop a pound of fat, just fluid. What's worse is that because they didn't exercise at their full capacity, they didn't burn as much fat or build as much muscle as they would have in a cooler environment. The long-term benefit of their exercise was reduced. For a couple of days, it really makes no difference in long-term health. But if you're constantly working out in a hotter environment, your workouts may be 50% less effective. Over time that number is dramatic. That doesn't mean everyone should workout in 72 degree temperature. In fact, the ideal number changes depending on the type of workout you're doing. According to OSHA (The Occupational Safety & Health Administration) the ideal workplace temperature range is from 68 to 76 degrees. The American College of Sports Medicine (ACSM) suggests that a fitness facility should be between 68 and 72 degrees Fahrenheit. The International Fitness Association (IFA) suggests a temperature range of 65 to 68 degrees Fahrenheit for aerobics areas. The only temperature that all three meet and agree on is 68 degrees Fahrenheit. So for cardio/aerobics areas, set the temperature to 68. The International Fitness Association recommends that when doing yoga the temperature should be kept at about 80. Competitions held in extreme environments are also different. If you plan on running a marathon in Death Valley, you should be training in temperatures that more closely match what you'll experience during the race. The same is true if you're entering a cold weather competition. For half your workouts, get used to the clothing and environment you'll experience during the race so you'll know what to expect when hit with the temperature extremes. The rest of the time, exercise in the appropriate temperature range for your workout type. The next time you workout, check the thermostat. If you're doing cardio or weight training it should be between 68 and 72 degrees Fahrenheit. For yoga expect it to be a warmer 80.